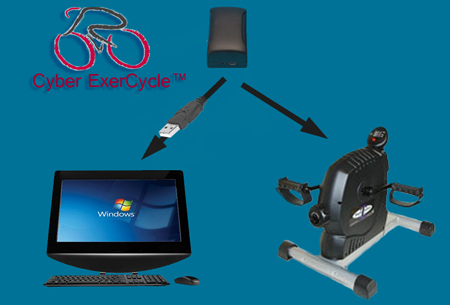 Interact with PC Games using the Cyber-ExerCycle game controller and a MagneTrainer (or DeskCycle) pedal exerciser. The faster you pedal the faster your character in the game goes. Steer with the provided game controller. 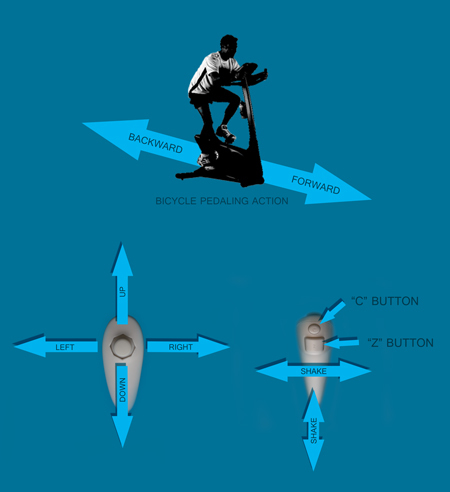 Connect the Cyber-ExerCycle controller to the MagneTrainer or the DeskCycle. The controller is sold separately from the exercise bike. The MagneTrainer is a professional quality mini exercise bike. It's recommended by doctors and therapists for exercise and physical therapy. It's ideal for building strength, losing weight, physical therapy, and cardio vascular workouts. It works with arms and legs. Whenever you're sitting down and your legs are free! Smooth, quiet adjustable Magnetic resistance. Nearly 3 times the adjustment range of other magnetic bikes. 15 inch wide front and rear supports for superior stability. Dycem® Pads adhered to the front legs keep the bike in place. Designed specifically for exercising at shorter desks (as low as 27 inches). Same patented resistance mechanism and high quality components as the MagneTrainer. Get excellent exercise while working on your computer, on your phone or any other activity at your desk. Safer than a treadmill desk and easier on your joints. About twice the maximum resistance of the Magneciser and MagneCycle. It is the lowest profile magnetic bike on the market. The pedal height is 9.5 inches compared to 15 inches of the MagneTrainer and other magnetic bikes. The low profile enables it to be used with standard sized desks as low as 27 inches. Same patented resistance mechanism as the MagneTrainer and MagneCycle. This insures smooth pedal motion at all resistance settings and in both directions. The DeskCycle uses the same high quality parts as the MagneTrainer to insure years of use. 5 - function display; speed, time, distance, calories and scan. Wide footprint; the front leg is 22 inches wide, the rear leg is 15 inches wide. Adjustable magnetic resistance; 8 calibrated resistance levels. The DeskCycle comes with a 1 Year warranty on all parts and labor. This is the same as the MagneTrainer. If you are unhappy with the DeskCycle for any reason, just return it to us within 30 days of receipt for a full refund on the bike. PlayStation®, PlayStation®2™, PS2™ and PSOne™ are trademarks of Sony Computer Entertainment Inc. XBOX™ is a trademark of Microsoft Corporation U.S. and GameCube™ is a trademark of Nintendo Co. This product is not designed, manufactured or endorsed by either Sony Computer Entertainment Inc, Microsoft Corporation U.S. or Nintendo Co. All other trade marks and trade names are respective to their various companies.